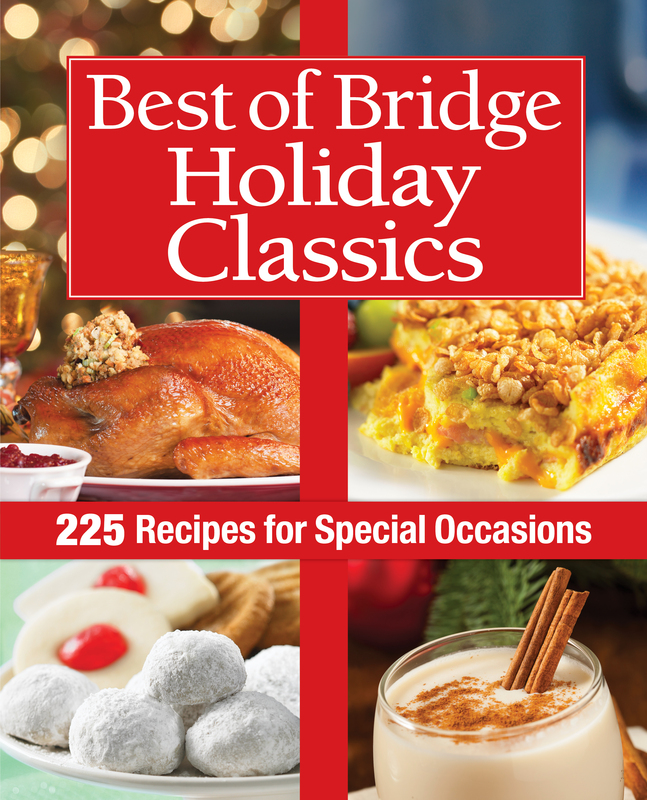 Robert Rose Inc. has offered me the opportunity to conduct a review of Best of Bridge Holiday Classics. This is the latest in the “Best of Bridge” series of cookbooks. While this cookbook is aimed at holiday entertaining, I would suggest there are recipes that would be suitable year-round for both everyday and special event use. The book has an attractive, sturdy hardcover and the pages are spiral bound making it easy for the book and pages to stay open for the recipe being made. The book features a collection of 225 recipes spread throughout eight chapters: Holiday Brunches, Cocktail Parties Plus, Buffets and Potlucks, Sit-down Dinners, Leftovers, Holiday Cookies and Squares, Desserts and Other Sweet Treats, and Food Gifts. At the beginning of each chapter, there is a separate table of contents outlining the recipes (and their page numbers) found in that section of the book. There is also a handy alphabetical index at the back of the book. In addition, there are a couple of pages at the front of the book giving sample menus for holiday brunch, a buffet party, a traditional holiday meal, a snowy Christmas Eve, New Year’s Eve Banquet, and a Vegetarian Celebration. Recipes suitable for each event are listed along with their page numbers for ease of retrieval. This is useful, particularly for those who have no idea which recipe pairs well with another or what to serve with what. When I am conducting a cookbook review, I try to approach it from the stance of how user-friendly it would be for someone with little culinary experience unless, of course, the book is highly specialized and advanced and is targeted for experienced cooks. So, I review recipes from the point of whether someone with little cooking and/or baking experience could take the recipes and easily follow and understand the instructions sufficiently to achieve success. To begin, I found the font in the book a bit large and folksy. Everything (ingredients and method of preparation) is printed in capital letters which I find makes the pages cluttery and difficult to read. Generally, the instructions for making the recipes are all lumped together in one long paragraph. This makes it difficult to follow the method. I find cookbooks that lay out the instructions in separate, step-by-step, paragraphs are easier to follow, particularly for less experienced cooks. Breaking down the steps of a recipe into separate short paragraphs makes them less formidable and daunting and it is easier and quicker to find your place and progress in the instructions as you go about making the recipe. I found the ingredients are used in the instructions in the order in which they are listed. The recipes in the book call for, what I would consider to be, ordinary ingredients which makes it easy to prepare the dishes. Most, if not all, ingredients would be found in standard grocery stores. The exact quantity of ingredients called for, though, is sometimes vague or lacking in the recipe. For example, on page 71, the recipe for Guacamole Cherry Tomato Halves calls for “1 small basket cherry tomatoes”. Cherry tomatoes come in various sizes of baskets and home gardeners would obviously harvest their own so it would have been clearer to have specified a certain quantity of tomatoes, in pound or kilogram measure, for example. I also found that the instructions for several recipes were somewhat vague as well. For example, on p. 169, the recipe for Rhubarb Relish was very vague with the method starting out by “Simmer, uncovered, approximately 4 hours” but it didn’t say what to simmer or what kind or size of pot to use– i.e., in my view, it should have started out by saying “Combine all ingredients in the order listed in a certain size of pot (i.e., small, medium, or large pot). Simmer, uncovered, approximately 4 hours.” I also found several recipes would neglect to state early on in the instructions to preheat the oven and the oven temperature would only be given as the last instruction, at the stage when the dish was going into the oven. Now, experienced cooks would automatically know to preheat the oven whether it was stated as the first step in the recipe or not. However, a novice cook would be unlikely to know of this requirement, hence the importance of stating this step at the beginning of the method/instructions. It’s very important to pre-read each recipe carefully all the way through before starting to make it to ensure that the amount of ingredients required and the method of preparation are clearly understood. In addition, I also found that, while most recipes did give a yield indication, some do not indicate a clear yield to be expected. For example, on page 231, the recipe for Nanny’s Real Scottish Shortbread gives the yield as “makes a tinful” which is not helpful as there is no indication what size of tin or how many shortbread the recipe makes and, as we all know, tins come in all sizes and some would hold four cookies and others 44, depending on the size of tin and cookies. This recipe does not indicate what size each shortbread cookie should be cut into. Regardless if that is how someone shared their recipe, the recipe should have, in my opinion, been tested to determine its exact yield before publishing it in the book. If someone is making a recipe and has a need for a specific number of shortbread, or servings, they need to know how many the recipe is expected to generate. There are a few color photos in the book and they are of good quality but there is certainly not a photo for every recipe. Including photos is so important in a cookbook as, not only do photos of mouth-watering food inspire people to try the recipes but the color photos also give a frame of reference of what the finished dish should look like. I tested two recipes out of the cookbook, choosing two in categories that I have significant personal experience. Robert Rose Inc has given me permission to share the recipes and their photos for Cranberry Scones and Crazy Crunch to accompany my review of this cookbook. The recipes follow at the end of this review. These combine a tasty combination of cranberries and orange; however, I found they did not have the light and airy texture I associate with scones and find I get from other recipes. I also did not find that they rose as scones usually do for me and they had a prevalent flour taste. I have a lot of experience making similar recipes and know that the caramel syrup has to reach the hard crack stage (300°F) before it is done. This recipe, however, gave a wide time span of “10-15 minutes” and a vague description of the mixture having a “light caramel color” for instructions to determine when the syrup is done. As any experienced candy maker knows, a five-minute span differential is a lifetime in candy-making and is the difference between success and failure. Also, there is no definition of “light caramel color” – what is a light color to some may be dark to another and, with no photo as a frame of reference, I did not find this particularly helpful. The recipe also does not indicate at what temperature the mixture should be boiled – i.e., over high, medium, or low heat, a rolling or gentle boil, and whether or not the syrup should be stirred as it cooks. In my view, it would have been more useful had the recipe given directions for the use of a candy thermometer and a certain temperature which is a more accurate determination of doneness. I used a thermometer and cooked the mixture over medium heat and found it took more than 15 minutes to reach the hard crack state of doneness. The recipe turned out for me and is tasty but I am not sure I would have had success had I removed it from the heat at any point between 10 and 15 minutes as the recipe suggested. Someone, inexperienced in candy-making, would not likely know how to adjust the recipe for success. Overall, I found the book contains a good selection and number of appealing recipes that call for tasty ingredients and I will certainly make more recipes from it. However, in my opinion and given the foregoing, some quality control and assurance over ingredient listing, instruction writing (and ensuring the instructions for each recipe are consistently written across the book) and, in some cases, precise recipe yields are missing. For a cookbook priced at $29.95, I want to know the recipes have been tested for success and have exact amounts of ingredients listed and clear, fulsome, accurate instructions along with the expected yield from each recipe. For this reason, I would suggest the book would be best suited for individuals who have experience cooking and baking as some recipes in the book could prove challenging for novice cooks. Disclosure: I received a complimentary copy of Best of Bridge Holiday Classics from Robert Rose Inc., for the purposes of conducting a review of the cookbook. I received no compensation for this review and was under no obligation to provide a positive review. All opinions expressed are purely my own. The following recipes are courtesy of Best of Bridge Holiday Classics by The Best of Bridge 2014 © www.robertrose.ca. Reprinted with publisher permission. Available where books are sold. 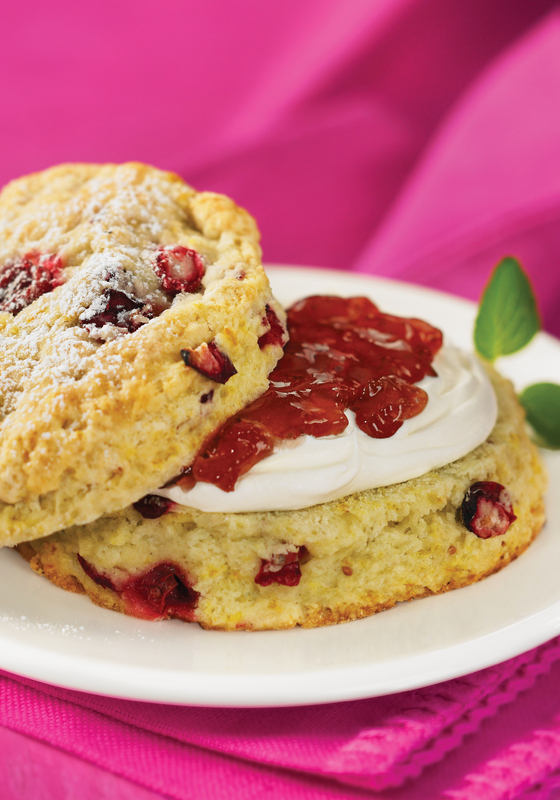 Cranberry Scones from “The Best of Bridge Holiday Classics”. Photo courtesy Robert Rose Inc., publisher. Crazy Crunch from “Best of Bridge Holiday Classics”. Photo courtesy Robert Rose Inc., publisher. Put this in fancy jars and give it as a little extra at Christmas time. 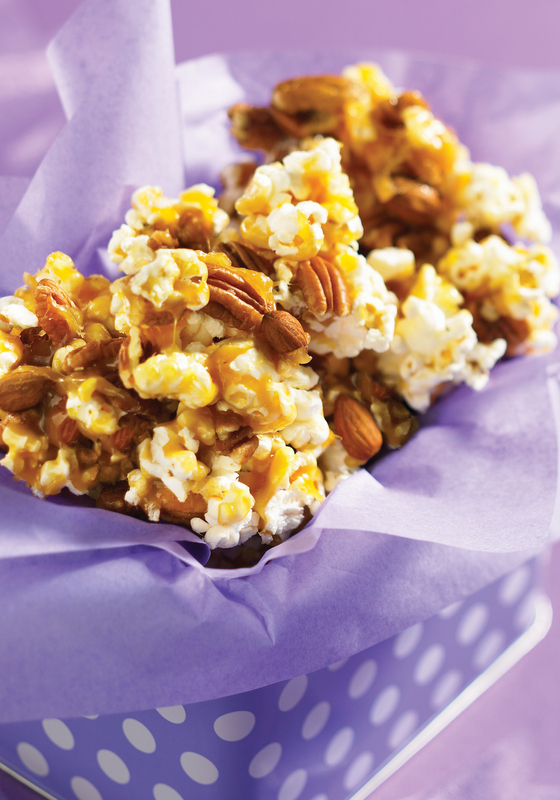 Mix popcorn, pecans and almonds on a cookie sheet. Combine sugar, vanilla, margarine and syrup in a pan. Boil 10 to 15 minutes or to a light caramel color. Pour over corn, pecans and almonds. Mix well. Spread to dry.